Now available in ebook at Amazon and Barnes & Noble. 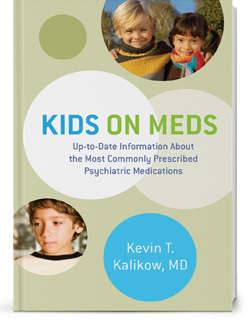 Kids on Meds is an up-to-date informational book about the most commonly prescribed psychiatric medication. See what people are saying below! "Kids on Meds is an important resource for professionals with a non-medical background...This book belongs on the shelf of all school mental health professionals. The science of psychopharmacology is demystified, and the book [is] clear, practical and up-to-date...[It] provides professionals with needed information to facilitate positive outcomes for children"
[A] must-read that should become a part of every mental health practitioner’s reference library. Dr. Kalikow provides rich clinical insights...[C]omplex issues are addressed with extraordinary clarity, compassion and wit. It’s as if the reader is receiving a personal consultation with a leading expert in the field of child and adolescent psychiatry"
This comprehensive, practical guide covers a plethora of relevant topics ranging from brain physiology and psychopharmacological principles to the nuts and bolts of determining the need for medication, prescribing medication for various conditions, and evaluating treatment outcome. Kalikow translates evidence-based information into everyday language that will suit the needs of a variety of audiences including prescribing physicians, psychologists, other mental health professionals, educators, and parents of children receiving treatment. This book serves a critical need in the fields of child psychiatry and psychopharmacology. Kids on Meds is a MUST as a reference tool for all practitioners working with children and adolescents. Kalikow is thorough and honest; his 'tell it like it is' approach provides detailed and crucial information to help us find our way in a complex and compelling field. I highly recommend this book. Are Psychiatric Medicines Over- or Underprescribed?